Our income from membership subscriptions pays for the basic running of the organisation. Subscription income funds our utility bills, library periodicals, basic maintenance and contributes to the Librarian’s salary. The Housekeeper is funded by income from the Courtenay Room, which also provides additional income for the Institution. We have an active programme of fundraising for specific tasks and projects and half our income this year (2018-19) comes from public grants. These grants currently fund the Programme Manager, 80% of library salaries and specialist contractors such as our Bookbinder, Conservator, Conservation Architect and Graphic designer as well as our conservation programme, education programme and displays and events. 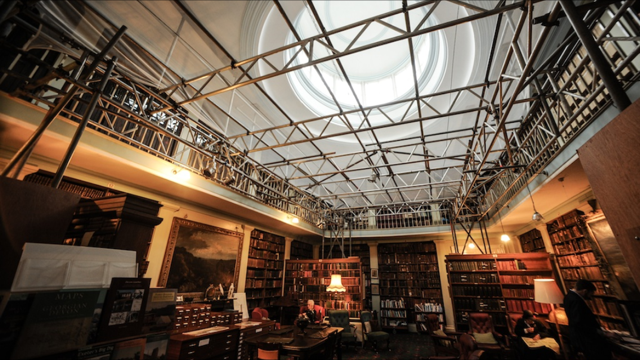 Our ‘Roof Appeal’ (2013 -15) was successful in generating the match funding needed to make applications to the Heritage Lottery Fund and Historic England. Our recent development project secured £316,000 from Historic England and £298,000 from the Heritage Lottery Fund. Further information is available here: development project. We have also received grants and donations from Garfield Weston; The Pilgrim Trust; The Duchy of Cornwall and Devon Historic Buildings Trust. We have a close working relationship with the University of Exeter and receive an annual grant to support our charitable objects of Education and Preservation.